Pairing If at Throwback, pair it with our Throwback Burger or Korean BBQ Burrito. It would also go well with decadent chocolate desserts, like fudgey brownies. 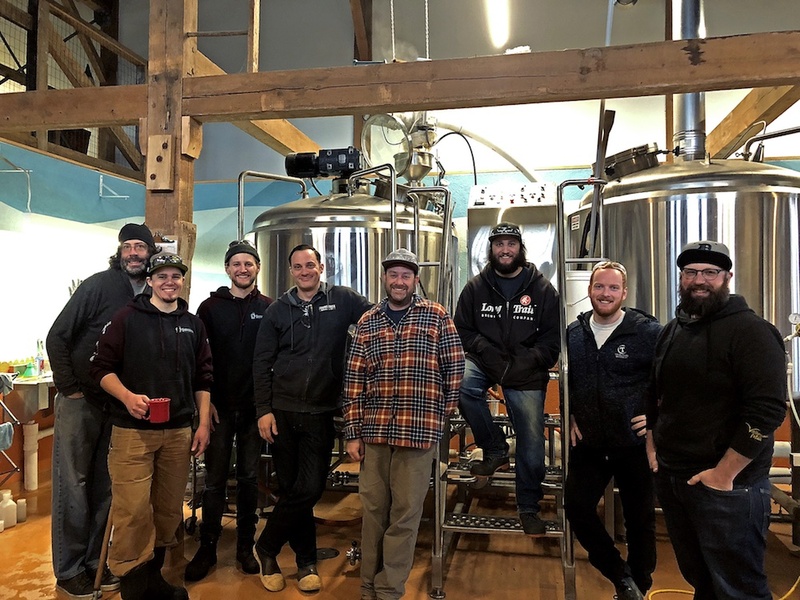 When we were deciding on what beers to make for this year’s Unafraid of the Dark VII beer series, we thought it would be fun to have one of the beers be a collaboration with a local brewery. Since our lead brewer Chris had been talking with some of the Stoneface guys already about doing a collab, and, since we love our Stoneface beers here, it was a pretty easy decision! What our teams have come up with is a Dry-hopped black lager that definitely tastes like a true collaboration – made with local malt (Pilsen and Vienna Malt from Valley Malt), but with that characteristic big hop and slight sweetness of a lot of Stoneface IPAs. This beer is called A Stone’s Throw, and it has a deliciously sweet pine, chocolate, and dark fruit aroma with a very juicy, piney flavor that finishes a touch sweet. One might think Stone’s Throw is a Cascadian IPA / Dark Ale instead of a Black Lager given the way this beer drinks – almost like a black New England-Style IPA (if that were a thing 🙂 ). If you think that, you wouldn’t be far off — we did definitely hop this beer like an IPA, adding in copious amount of Grungeist, Galaxy, Calypso, and El Dorado hops. A Stone’s Throw clocks in at a deceptive 8% – so beware as you enjoy – you would probably never guess its strength! – Appearance: This beer is chestnut brown in color with an off-white head. – Aroma: A Stone’s Throw has a prominent sweet pine nose with undertones of chocolate and dark fruit. The more the beer warms up, the more the chocolate notes come out. – Taste & Mouthfeel: For a lager, this beer has a surprisingly big body – not too heavy, but on the medium to heavy side of the scale. This beer tastes exactly like it smells – sweet pine, light chocolate, light stone fruit, and juicy orange. We’ve been calling it a ‘dessert IPL’, with the IPL standing for India Pale Lager – which is what essentially IPA as a lager. – Pairing: If you are enjoying this beer while eating here at Throwback Brewery, we recommend pairing it with our Throwback Burger or Korean BBQ Burrito. It would also go well with decadent chocolate desserts, like fudgey brownies. – Serving glass: We will be serving this in a 12-oz tulip glass. – Stats – ABV 8% and 74 IBU. A Stone’s Throw will go on tap here at Throwback Brewery on Wednesday, April 4th. Come on by and give it a try!